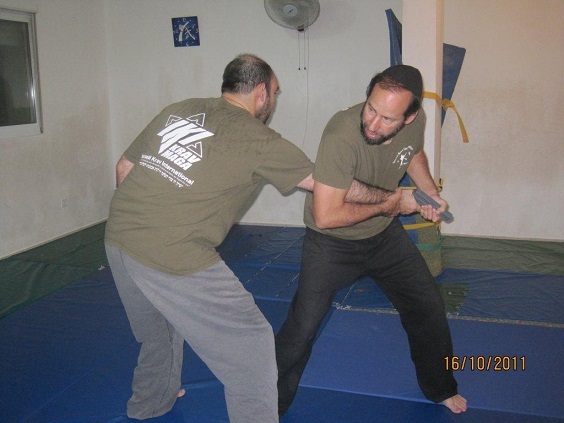 Moshe controlling arm and striking the neck, instantly following this the right hand also helps control the gun arm. Otherwise a man of this size and strength will pull away. Now I fully understand the term/phrase "Gun Control". I understand it is a long standing debate in the United States of America as to how much control the government should have over the rights/privilege of the civilian population to own guns. But I am using this phrase as a jumping point for something totally different: A major debate among self-defense instructors, i.e. those instructors who actually deal with realistic self-defense. We all realize that being threatened with a gun is a major problem, and highly risky. We all realize that there are times we must attempt to disarm the assailant or face nearly certain death. The question is how. Within the Krav Maga world there are different approaches. 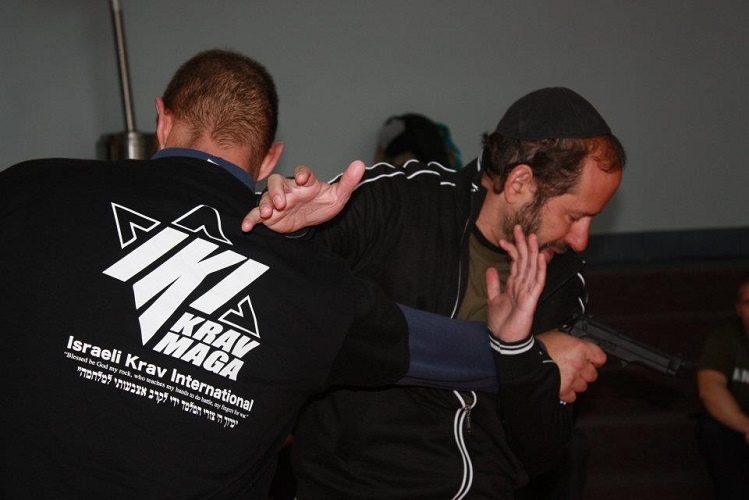 We at IKI Krav Maga are an independent evolution of Krav Maga, and we honestly feel we have made major improvements. Controlling the arm and hand of the man with the gun. Striking a man like this is no guarantee that he will drop the gun. At IKI our philosophy is that you must control the weapon. No strike to the head or body is a guarantee that the individual will drop the gun. The idea that an elbow to the face or a kick to the groin will cause him to drop the gun or even to enable you to take it away is pure fiction. Any police officer with real life experience will support and verify what I am saying. They will tell you stories of a guy being hit in the head to the point that his skull is showing, and...he will not let go of the object in his hand. You will hear stories of a guy getting repeatedly kicked in the groin, and...he will still be standing. These strikes, with all due respect, are not guaranteed fight ending moves. As such all our IKI gun defense focus on quickly controlling the "gun hand", the hand and arm that are holding the gun. We do this in a way that our body position is solid, we are stable and protected, we cause shock to our opponent and we Control the Gun. This has proven itself many times in actual street confrontations. Our students have lived to tell their stories.